The Royal Dee Sailing Trust. World famous yachtsman launches new trust to give sailing opportunities to young people. Round the world yachting pioneer Sir Robin Knox-Johnston has helped to launch a new trust that will give life-changing opportunities to young people by introducing them to offshore sailing. The Royal Dee Yacht Club Trust will finance activities each year for young people in the north west of England, North Wales and Ireland. in memory of her late husband Peter, both of whom have been long-term members and supporters of the RDYC. The Trust aims to encourage participation in offshore sailing, including to younger people who may not otherwise have access to the sport. It was officially launched by Sir Robin on Sunday, July 29 who added his support during a visit to Liverpool for the climax of the biennial Clipper Round The World yacht race which he established and for which is executive chairman. He was famously the first person to sail solo and non-stop around the world in 1969, and also set the first record for the fastest circumnavigation with late Sir Peter Blake. 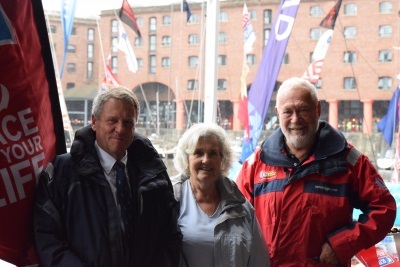 Chair of the trustees, David Taylor said: “The wonderful opportunity presented by Jean Baker and her later husband Peter means that we will be able to support youth keelboat sailing from our base in North Wales and the North West of England. The club will post further details about the mechanics of the award and further eligibility requirements on its website www.royaldee.co.uk in the coming weeks. Copyright © 2012 RDYC. All Rights Reserved.